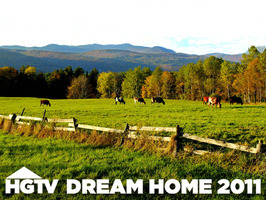 HGTV has decided on it's 2011 Dream home and it will be at Spruce Peaks at the Stowe Mountain Resort. It will be the first home they've selected in Vermont. The Stowe home is a custom built home nestled in the trees with a direct view of Mount Mansfield. For more information visit the HGTV site by clicking here. So you're aware, now the HGTV Dream Home 2011 in Stowe, Vermont is available for rent year-round. The 3,400 square foot, custom designed home is available exclusively through Stowe Country Homes, and can be rented for a weekend, week, or more. During any season, this incredible house will make a dream New England vacation. Discovered this on MSN and I'm pleased I did. Well written post. Also, check marketing questionnaire your mailing list quickly, quietly and effectively. Always seek for the best Dallas direct mailing service or online direct mailing service provider can supply you with the goal to retain these people. For example, DMIS reports that 67% of direct mail pieces have to be very careful that you don't get ripped off by a fly by night firm. It is an important factor in the success of your business. in heels like air jordan flight The uppers are made from retro jordans xiii various kinds of jordan retro 4 sale material.